New Patient Center for DesLauriers Chiropractic Group Inc.
Our beautiful clinic is located in the historic Five Corners area of White Rock. Natural light makes our office bright and calming. You’ll find it’s a tranquil place to be. We want to be your partner in better health. Your first appointment is an information gathering session that allows us to learn how we can help you. You’ll have a private consultation with the chiropractor, then move on to an examination that includes chiropractic, orthopedic, and neurological testing. Next, we’ll use hi-tech computerized scanning technology, including Surface Electromyography (SeMG), Thermography, and a Pulse Wave Profiler to determine how much stress your nervous system is under. 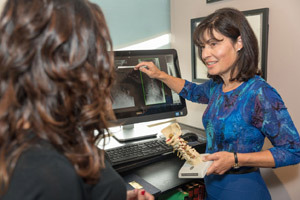 If necessary, we’ll use our on-site digital X-ray facilities to take images of your spine. You can plan on this visit taking about an hour. On your next visit, we’ll sit down with you to review our findings from your examination. You’ll find out what’s wrong, can we help you, what type of care you need, how long it will take and how much it will cost. Please remember that during this visit the choices made are entirely up to you. We want to work with you to come up with the best possible plan to help you heal. With goals clearly defined and your consent, we’ll begin care with either chiropractic care and/or the use of our Bioflex Laser or spinal decompression therapy if needed. On your regular visits, we’ll follow your care plan. You’ll receive an adjustment or other therapies and have a chance to talk to your chiropractor, getting answers to any questions you have. We may go over things such as exercises or provide you with posture tips or lifestyle advice, depending on your needs. We’ll give you follow-up examinations at regular intervals to determine how you’re responding to care and make any changes or recommendations necessary. When you step into our office, you’ll see that we have monitors playing with tips that educate you about various health issues, what you need to know about them and how to deal with them. We also hold wellness classes every 2 weeks to talk to you about health, where it comes from and where chiropractic fits into the picture. We want you to have the information needed to make cost-efficient health care decisions. Are you wondering how we might be able to help you and your family? Contact us today. X-rays are located on-site, and you can park for free in our lot.